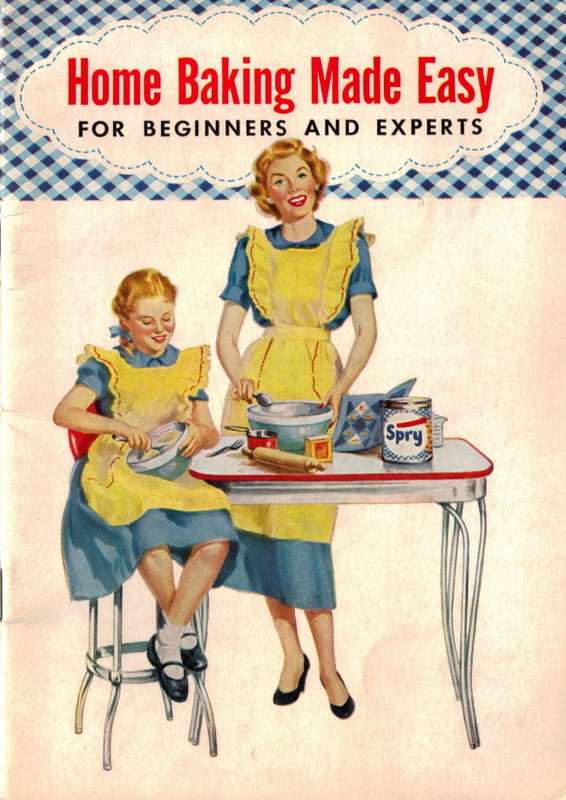 Here is page 2 of the vintage cookbook: Home Baking Made Easy that was published in 1953 by Lever Brothers Company. 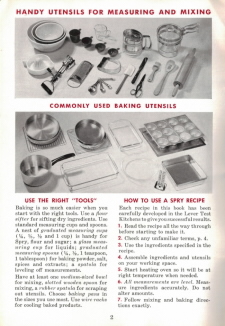 Baking is so much easier when you start with the right tools. Use a flour sifter for sifting dry ingredients. Use standard measuring cups and spoons. 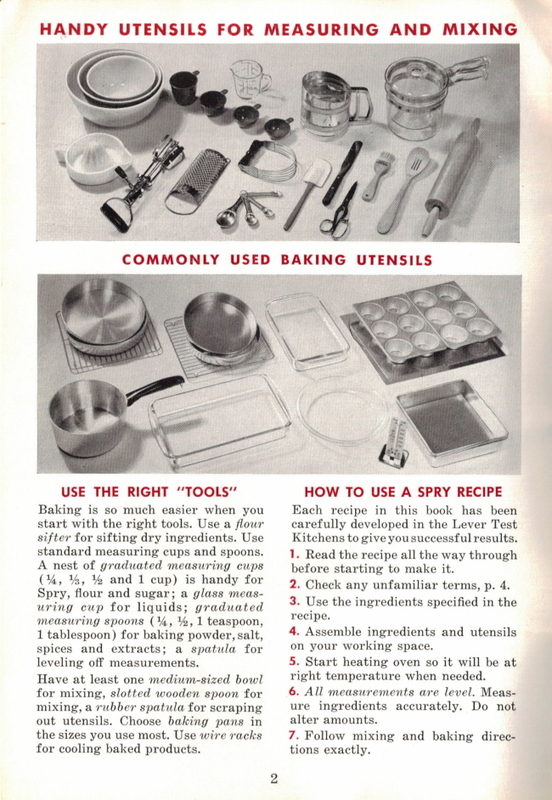 A nest of graduated measuring cups (1/4, 1/3, 1/2 and 1 cup) is handy for Spry, flour and sugar; a glass measuring cup for liquids; graduated measuring spoons (1/4, 1/2, 1 teaspoon, 1 tablespoon) for baking powder, salt, spices and extracts; a spatula for leveling off measurements. Have at least one medium-sized bowl for mixing, slotted wooden spoon for mixing, a rubber spatula for scraping out utensils. Choose baking pans in the sizes you use most. Use wire racks for cooling baked products. Each recipe in this book has been carefully developed in the Lever Test Kitchens to give you successful results. Read the recipe all the way through before starting to make it. Check any unfamiliar terms, p. 4. Use the ingredients specified in the recipe. Assemble ingredients and utensils on your working space. Start heating oven so it will be at right temperature when needed. All measurements are level. Measure ingredients accurately. Do not alter amounts. Follow mixing and baking directions exactly.